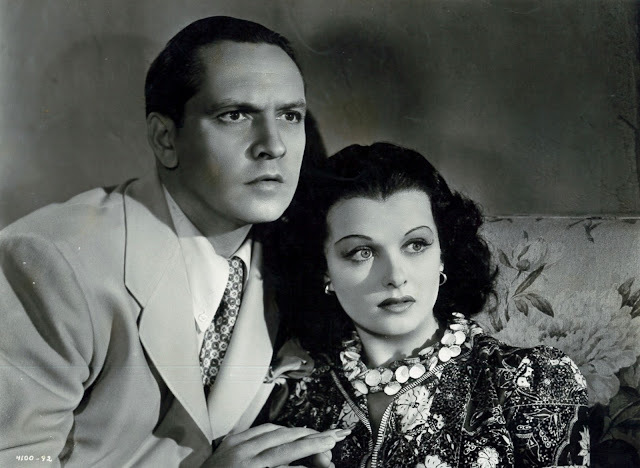 Detective Fredric March tracks accused murderess Joan Bennett across process-shot land and sea, Trade Winds celebrating state-of-art fakery circa 1938. I didn't note an inch of real location here, but as Trade Winds trades in Hollywood at phoniest, who's to kick? March was freelance and evidently liked comedies, or maybe they were what paid best. Walter Wanger produced, but according to Matthew Bernstein bio coverage, left director Tay Garnett alone to package fun. Wanger wife Joan Bennett gets image transform a simple matter of blonde hair turned dark, this the charm, she'd later say, and escape from "simp" parts the bane of a so-far career. Trade Winds is another of "double-cross" comedies where someone forever does a run-out to leave others with the bag, none of it much funny, but they act a good enough time, contagious for us after while. I read that Ann Sothern got Maisie work for impression made here. Is any of that series good? I've never watched one. Something holds me back. Maybe it's Sothern, who I never really warmed to. Ralph Bellamy is broader here than customary, to good effect. Tay Garnett was good at movies done Hollywood way, as in superficial, aspiring to little beyond 90 minutes of forgettable fun. You'd not suspect from Trade Winds that he started in talkies as quite the bold experimenter (see his earlier RKO's). I do like Ann Sothern but the blowsier the better (saw her in a dandy ALFRED HITCHCOK HOUR just last night.) Warner Instant has scheduled most of the MAISIE's in the last year or two and I've tried to catch up with them. Alas, I think the 'good' early episodes, like a lot of Metro series entries, try way to hard to make you forget that they are B movie reworkings of A movie originals - strike me sorta bland. Some later ones are sillier and more contrived (in a good way!) and seem more fun to me. UP GOES MAISIE is top notch second feature junk, with our girl rescuing the 'hero' in a tiny auto-gyro! The practical effects in that one, by the way, are especially good! If you don't care for Ann Sothern you won't like the MAISIE'S. She's pretty much the whole show. This is a funny comedy that in its favor I can say that it has no pretensions. I managed to get an old but watchable recording from Spain's TVE with the original English soundtrack and subtitles. The MAISIE comedies used to play a lot on TNT Latin America, in its earliest years when they played classics from the Turner library: they are OK, well done, the stories are routine (Ava Gardner appears in one of them in her beginnings), but Ann Sothern is delightful enough to make them enjoyable. There have been several Maisies on Warner Instant HD, and I should give at least one a chance. HD, after all, has been re-birth for a lot of films I've either not seen or ignored for too long. Hi-Def is, for Classic Era watchers (at least for me), like invention of the printing press. With Sothern's Maisie, you have to take her as a comic knockoff of early Joan Blondell with more brass and less feeling. I'm not much for the series. One, Maisie Gets Her Man, although she's teamed with Red Skelton in a less than great romcom plot, seems to have supporting characters bodily lifted from a Joe Liebling New Yorker story, The Jollity Building. The names are changed, but some of the dialogue from the story is there. Sort of like Elvis in FUN IN ACAPULCO. The King never left the Paramount lot. My dad remembered TRADE WINDS fondly, partly for the Joan Bennett hair change, but also for Ralph Bellamy's oft-repeated line, "Care for a min? They're double-strength!" I think you might want to watch this one again. Hiding in plain sight is a brilliant comedy performance by March. Everyone else leans on it too much (although I love Ralph Bellamy) but March -- I mean, check out the moment when he "falls in love with Bennett at first sight." Have you ever seen an actor play that cliche more convincingly? March underplays while everyone else hams it up. And Dorothy Parker's banter shines when it is undersold. LET'S FALL IN LOVE(1933) her first movie lead and clear evidence she had something special. The picture's an agreeable backstage Hollywood comedy with music. Edmund Lowe's superb as a film director; Sothern's his star in the making. The lady's also excellent in 1937's SHE'S GOT EVERYTHING, one of a half dozen or so comedies she made with Gene Raymond. This one's by far the best - and I've always thought the witty script would make a great basis for a Broadway musical, even now. Forget almost everything she made at MGM, including each and every Maisie film. They're all turkeys. But she's Oscar level superb at Fox in Mankiewicz's A LETTER TO THREE WIVES(1949), more than holding her own against terrific work from Linda Darnell,Paul Douglas,Kirk Douglas, Florence Bates and the rest of a strong, strong cast. A comeback role as a blowsy old harridan, supporting or rather tormenting Olivia de Havilland in LADY IN A CAGE(1964) is also a triumph. She definitely should have been among the supporting actress nominees that year. I suspect movielovers on the fence about Sothern would likely come away with a new admiration for her after seeing any of the above.